Unfortunately I wasn’t able to make it to Railex to see the Dduallt action this weekend as we had a family holiday booked. Alongside the usual beach activities, gardens etc we managed to fit in trips to the Brecon Mountain and Teifi Valley railways. The Brecon Mountain was scored as the 7th best line in the UK and using this track below the ‘soon’ to be opened 2 mile extension would likely push it higher. The Baldwin ex SAR No.2 was our loco (good choice indeed). What a model that would make! It was previously owned by Mike Hart and expected to run on the WHR but is a little underpowered perhaps? Other things we liked: the balconies allowing views like this…the viewing platform allowing you to see the works and the play area for the kids. The Teifi Valley scored as the 17th best in the country on a par with say Launceston. It was all a little ramshackle, with various huts and sheds meaning a rather disjointed experience and the carriages were really showing their age. The two steam locos they have are well looked after though and the line has a good deal of potential if only they can solve the missing bridge problem (below). The guard reckoned £200k was needed and that raising that would be a stretch – gosh have some imagination (!) - £28m found for the WHR! However as you can see from the shot, the abutment on the far side is in a bad way and the bill could be way more than £200k. On the one wet morning we visited the Swansea waterfront museum and (unexpectedly) we ran into some FR related bits. Firstly a beautiful model of a Porthmadog slate ship and in the adjacent displays… a 7mm double engine and a video of Porthmadog past and present. The first set of rails have been soldered to the brass screws. The base green grass is also in view, with further coats to come plus detailing, so no worries that it doesn't yet match the older grass on the adjacent board. progress is being made. The new roadway surface has been painted, the grassy area in front of it has been coloured brown underneath and received a coating of static fibres as a base layer. I have also sourced the new trees that I will install (from International Models). Finally the 8 brass screws for the board join have been installed, the sleepers drilled to take track pins and lengths of track stripped of sleepers at the relevant sections and cut to length. The next job is to install the track with pins and solder to the screws, then the board join can be cut and electrics reattached. Then we test and then we ballast and then we're done (except for the new water tower base, but that's a small job for later). Progress has been slow due to extreme work commitments but I have managed to source another pot of the paint I used for the roadway surfaces (crown fashion for walls herringbone) which was difficult a few years after I bought the first pot! I have also found 8 small brass screws which will be used to secure the rails across the new board joint, a departure from the copper strip method that gave so many issues with shorts. It should also be more secure. 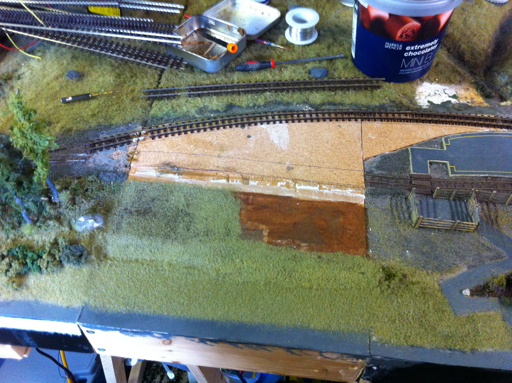 A piece of 40 thou plastikard has been glued in place to create the base surface for the road too. 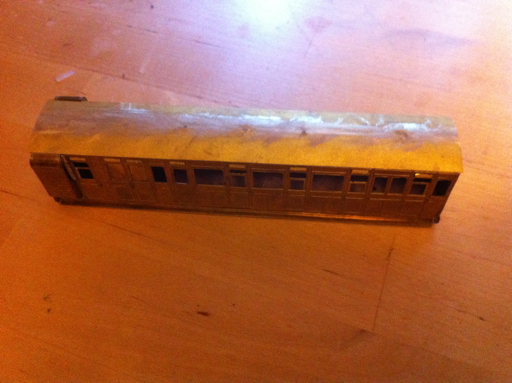 Today I hope to paint this and secure the track in place, which would be good. 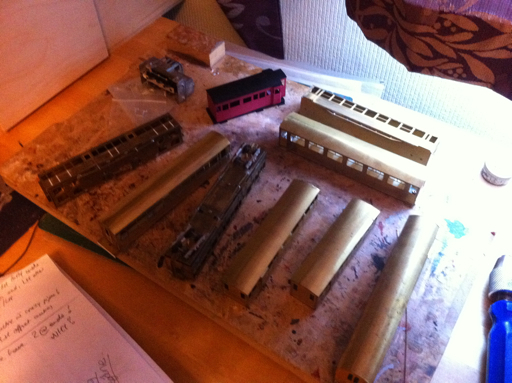 Then testing can commence before ballasting and painting the track with sleeper grime. The rest of the carriages have been titivated ready for spraying, but I'll wait until I can use Dad's spray booth for that. That was a whole evening's work alone. The langley kit for the ex L&B snapper bar carr (looks like a brake but it isn't), that I've had in the drawer half complete for a while has had some work done to it. I've filled the holes in the roof, added clips to make the roof removable and soldered on the long footboards both sides. 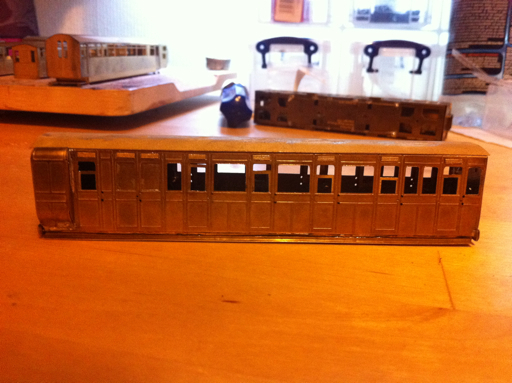 A few details on the ends, the interior and handrails remain to be completed. I have yet to decide whether to use the included bogies which are ok or to swap to the superb greenmax bogies I usually add to my Worsley works FR stock. Also being prepared for a spraying session are FR carrs 104, 106, 112, the new 116, 122, 124 plus vans 4 and 5. The WHR ex C&U mess Carr/brake is also stored ready for a respray as the first attempt was rather too pinky. Half made up and in the drawer are obs 100 and 102 but these need roofs attaching/forming so they are a little behind. The grassy area of the extension has been mown (using a hair trimmer) and titivated before being painted LNER Doncaster green (randomly applied with much thinners). 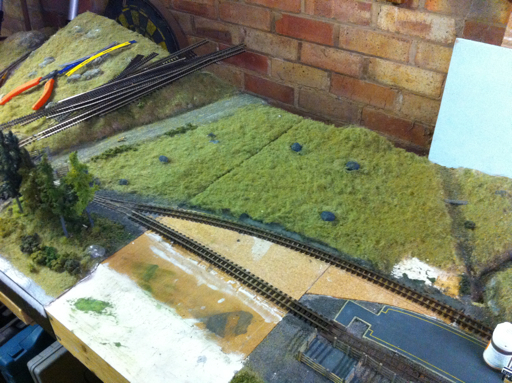 Then a woodland scenics static grass mix was added on top, stuck on with hairspray. The few outlying rocks have had the first few coats too. Cork has been cut back to the correct profile and all is reading for tracklaying and electrification. I will revert to soldering to brass screws at board joins due to the shorting problems we had with copper clad strip. Finally a new trackplan for the hidden sidings has been developed and requires two more lh points to be found. Shouldn’t you be going to wales soon…? Indeed you should. Check this out! Snowdon Mountain Railway – took the early bird train thinking we might get early morning misty conditions, but oh no! Only 30 mins at the top was nowhere near enough! Cafe nice but quite small really. The new plaque added to commemorate the ‘completion’ of the ‘40’ mile railway. This poor shot of the Statfold mallet at Meillionen (due to early evening light issues) was to be my only experience of the mallet moving. The next day I found her at Dinas about to be loaded later onto a trailer and thence back home to have her axleboxes attended to. Other shots at Beddgelert Forest halt. In the works the green (ex black 143) NGG16 comes along as does the new service carriage (previously a semi-open!). The scenery really is superb – and the weather too! The osprey nest (3 eggs have been laid) and the new lamp room at Beddgelert – a nice heritage feature. The underframe for the new super barn 121 and parts of the heritage footbridge for Tan y Bwlch. The ‘new’ other end obs ex 101 – now 123 – and on this occasion not being used as an obs! Not many people get the chance to do this, so I was very grateful to have been invited. What a ride! The journey up behind Merddin was impressive as a starting point! and when Merddin left us at Dduallt…the rollercoaster was an experience not to be forgotten! We really went for it round Boston Lodge curve but still needed a little push from Moelwyn to get into Harbour Station. A small affair this year but John Wooden was there with his excellent new layout in 009 and his mini train has to be seen to be believed. Harlech Castle was called into action to fight lineside fires (naughty Merddin!). and of course there was a chance to sample the moose. We enjoyed a trundle along the lake and this time managed to climb up to the Quarry Hospital where the views were superb. "The Coalition" rescued from Llechwedd and in shocking condition. Heritage carriages always interest me, here is probably the best interpretation of the original Pickering brake NWNGR livery – nice! and someone’s made a model of the mystery car! http://www.festipedia.org.uk/wiki/Carriage_Mystery for info if you’re not aware of the mystery! and a tidy little book due out soon…with a tidy price!